If a week is a long time in politics, the last ten days since a majority of those voting, but a minority of the UK electorate, voted narrowly for Britain to leave the European Union, have seen enough Darwinian political evolution to fill a geological epoch. Big beasts, like the famous “Hairy Johnson” are now almost certainly extinct, while the small but vicious, rodent-like predator, the Gove, hovers on the brink, threatened by the very forces helped to unleash in the Conservative Party and the Country. Meanwhile the Corbyn clings on stubbornly in its urban, North London, habitat, but for how long before it drops out of the political big Red Book of endangered species? Indeed, such has been the failure of the political class of all parties to plan for a Brexit vote, that these events may even be final proof that there is no such thing as Intelligent Design, and that Chaos Theory rules. Of course, those of us who carry European Union passports issued by the British Government are subjects, or citizens if you prefer, of the United Kingdom first, and are archaeologists, historians and heritage professionals second. We all have to live and work in a nation where David Cameron’s unnecessary referendum has lobbed a very large stone into the previously largely tranquil pond of the body politic and some of the particles stirred up from the sludge under the stones at the bottom of the pond are noxious. This makes it essential that, individually and collectively, the heritage sector plays a full and public part in the post referendum clean up, detoxifying and giving a democratic, fact driven, reboot, to the “Post Truth” politics of the referendum campaign. Against that background, if the reaction on Social Media is anything to go by, while the refuse of the political class, and the accumulated assumptions of over forty years, hit the fan, archaeologists and others in the heritage sector have largely met the result of the Referendum on the United Kingdom’s future membership of the European Union with a mixture of grief, fear and anger. Even before the prospects for the future for heritage jobs and the consequences for the historic environment of a life outside of cooperative European funding, and EU legal and environmental structures is contemplated, the fear is real at a personal level. All this because of the personal rivalry and ambition at the top of the ruling Conservative Party, between the now outgoing Conservative Prime Minister, David Cameron, who could not manage a small group of anti-EU blow hards in his Parliamentary Party and was afraid the right wing protest party, UKIP, would cost him a majority in the 2015 General Election, and fellow old Etonian and Bullingdon Club member Alexander Boris de Pfefel Johnson, who wanted to become Prime Minister and calculated that a narrow loss in the referendum campaign while leading the Brexit campaign would best serve that purpose, even though he did not believe in the snake oil he was peddling. Overall, such is the emotional and intellectual dislocation brought about by the referendum result, that response the heritage sector almost certainly mirrors the responses from at least the 48% of those voting who backed “Remain”. There may even be “Brexiters” in the heritage sector who, like Kelvin Mackenzie, the former editor of Brexit’s cheerleader, Rupert Murdoch’s “The Sun” newspaper, are now experiencing buyers remorse. That time share on the Costa del Sol seemed like such a good idea at the time. At the wider level what is certain is that, whatever the stance of individual members of the heritage sector, the personal and professional assumptions of anyone who entered the heritage professions after Britain joined the then Common Market in 1973 have been blown apart. What is worse, the expectations, and unforgivably the hopes, of those seeking to join the heritage professions as students, researchers and future professionals, have also been torn up, with no sense of the consequences of such a traumatic amputation of opportunity even having been debated at even the most basic of levels, such was the scream of the white noise generated during the actual referendum campaign, primarily by the Leave campaign’s cynical dog whistles warning of the alleged problems and risks generated by immigration into the UK. Given that the situation Britain faces post referendum is so serious, and the apparent break down and dysfunction of the political system is so massive, it might seem parochial, even self centered, to turn to look at the potential impact of the advisory note given to the Governing class by voters in the 23 June Referendum on the archaeological and heritage sectors alone, but actually this is merely an exercise in what more or less every sentient adult in the UK is probably doing at the moment. That is wondering what the hell happens next? Starting with a wide angle lens, Archaeology is a 93% Graduate Profession which suggests that, if the trends of wider polling were reflected in the Archaeological Profession some 57% of Archaeologists with a first degree will have voted “Remain” on 23 June. For those with a higher degree the percentage rises to 64%; while archaeology students with a vote would have broken 80%, or four to one, in favour of “Remain”. It follows that whatever the consequences of the Brexit vote, archaeology and the wider heritage sector will be impacted significantly by something its members did not vote for. With commercial archaeology servicing planning and construction acutely vulnerable to any economic downturn, and the Research and Higher Education sector vulnerable to any tightening of rules relating to work and study abroad and the potential loss of European research funding, it is also the case that the nature of the potential damage to the sector is clear, while any potential benefits of Brexit are much harder, if not impossible, to see. For example, on Government figures, 32,000 jobs have been created or protected by European investments projects in the London area alone, while in the South West and Wales, both regions which voted “Leave”, the figures are 13,000 and 16,000 respectively, with those areas hosting hundreds of EU funded projects large and small. A considerable number of those jobs will have been related to construction and infrastructure, the conservation of the historic environment and tourism, all of which employ heritage specialists, while any downturn in the wider economy brought about by Brexit, especially any downturn in the construction sector, will impact severely on archaeology in general because, on the latest figures, some 81% of archaeological jobs are associated with planning archaeology and heritage advisory roles. In the commercial sector, where most archaeological jobs reside, from the lowly, skilled and dedicated [if sometimes grumpy] digger, though specialisms such as pottery analysts and geophysicists, to the be-suited heights of an MCIfA Project Manager, we are already seeing suggestions that the two biggest potential areas of future employment, the HS2 High Speed Rail link between London and the North West, and the Heathrow/Gatwick expansion might be postponed, if not cancelled altogether. “There will be a shortage of skills and manpower. There’s been a shrinkage in the number of professional archaeologists, and a loss of skills. And if suddenly we’re getting a lot of new housing and building development, we’re going to run out of archaeologists. We won’t have the skills base we need to do a professional job. While as recently as May this year, Historic England was again warning of a shortage of skilled archaeologists to service these projects, and the likely need to import archaeologists from Europe and elsewhere to support planning conditions. Now not only are the projects which would have supported those jobs under threat, but the whole issue of the free movement of people to make up such skills shortfalls for future projects which do go ahead has been thrown into question. This threat to the free movement of people is significant because that same study from Historic England also revealed that in 2012/2013, 7% of working archaeologists came from outside the UK, with 3% coming from other EU members. In short, it is not just agriculture, the NHS and care sector and skilled building trades, which depend on workers born outside of the UK choosing to work here to fill vacancies. Indeed, even if the economy does not retrench, there could well be a shortage of capacity within the archaeology sector which could only be solved either by recognising that the free movement of labour is essential to operating a viable economy in the modern world, or by loosening planning and environmental rules to further reduce the amount of archaeology undertaken. An outcome which would chime with the direction of travel of the Cameron/Osborne Government’s since the election of the Conservative led coalition in May 2010. What is certain is that in any post Brexit economic downturn which hits the construction sector, archaeological jobs will be lost. Indeed, there are already stories circulating in the social media of archaeologists being laid off. Meanwhile two major property investment funds, Standard Life and Aviva have frozen redemptions for a year so that investors cannot remove their cash, something which last occurred in the crash of 2008. In the worst case scenario of a post Brexit recession in the construction industry several generations of skill and expertise in all areas of field archaeology could be lost, with the ability to revive those skills severely, if not fatally, damaged, and not just in Britain. Meanwhile, in the Universities which supply the bulk of the workforce to the heritage sector [remember 93% of archaeologists are graduates], the situation is equally uncertain, and potentially dangerous with regard to future opportunities and capacity within the sector. On 28 June the the Minister of State for Universities and Science, Jo Johnson, [the younger, quieter, and arguably more competent, brother of Brexiteer Boris], released a statement which was clearly designed to reassure the Higher Education Sector and those who study and work within it. Particularly staff and students from within the EU. The statement essentially said, ” you will be all right for now, but as to the future, don’t ask me.” In other words it was a ministerial, “not my problem guv’,” shrug of the shoulders. Faced with even the responsible Government minister acknowledging that his department has not got a clue where things will end up, at least two generations of administrators, lecturers and students brought up on the certainties of access to courses and research opportunities across Europe and the potential for funding from the EU, now face having to create whole new relationships and structures and having to secure fresh sources of money, with the potential that at the very least, working and even travelling in Europe will become that much more expensive and possibly complex, with the potential of having to comply with a bureaucratic system of points, visas and work permits. That is unless the settlement which the UK reaches maintains the current access to the European Economic Aria [EEA] and to European research and innovation funding streams and with them the freedom to travel, study, work and participate in exchange programmes such as Erasmus [in which case what was the point of Brexit in the first place? But that’s another argument]. The only other alternative is that the UK Government, or what remains of the United Kingdom if Scotland does vote for independence once Brexit has been achieved, maintains at least the status quo ante in real terms by increasing the investment in Higher Education, research and innovation, perhaps using the much touted dividend of cash which the Brexiteers claimed the UK would not have to send to Brussels as its EU subscription. However, increasing public investment is something which the Cameron/Osborne Government has steadfastly refused to do and in any case, however much the alleged cash dividend actually is, and it certainly is not the £350 million per week daubed on the side of the Johnson/Gove, Brexit Battlebus, it has been spoken for several times over during the referendum campaign and not for heritage and higher education. In any case this would be no small loss as in the area of Research and Innovation the amount of money currently allocated from EU funds which could vanish from the system is eye wateringly large. During the 2007-2013 Framework 7 funding period the UK won a high proportion of the most significant grants awarded by the European Research Council [ERC]; grants to the value of €1.7bn. At the same time, two countries which have access to ERC funding as associate members, a status the UK would probably aim for under Brexit, Switzerland and Israel, were awarded just €0.6bn and €0.4bn respectively and were barred from taking part in the principle policy discussions within the ERC. Under the current Horizon 2020 programme UK-based researchers are leading more projects than any other EU or Associate nation, a total of 892. Israel and Switzerland together barely muster the leadership of one hundred projects. However, there are already anecdotal reports of UK academics being asked to remove their names from applications in case it prejudices the prospect of a grant being awarded. This is an unprecedented series of perfect storms approaching the heritage and higher education sector. As a result maintaining morale and confidence is of utmost importance and this makes it essential that at a professional level all the representative bodies and learned societies in Archaeology and Heritage; the CIfA, the CBA, the Society of Antiquaries, the Museums Association and the rest; take steps immediately to talk directly, and be seen to talk directly, to the Civil Servants in all the Government Departments which carry any responsibility for heritage, the historic environment, education and research. The objective behind this strategy is that whenever a new Government is installed, under whoever wins the current Leadership battle within the Conservative Party, the lines of communication are already in place to ensure that the voice of the sector is heard and continues to be heard, as close to the actual negotiations with the EU as possible. It is also essential that the heritage sector takes an equally visible and proactive role working with all our academic colleagues in the Higher Education sector to limit the damage done by the Brexit vote. the free movement of academic staff, students and workers, including continued access to the Erasmus programme for UK students. This last requirement is the least the 16 and 17 year olds applying for University who protested outside Downing Street the day after the Brexit vote deserve. At the same time the similar lines of communication should be set up with opposition political parties and the devolved administrations of, what remains for the time being at least, the United Kingdom, to ensure that the voice of the heritage sector is heard around the table when those institutions too take part in the negotiations which will determine our future, in or out of the EU. Finally, for now, and for at least two years after the now [in]famous Article 50 of the Lisbon Treaty is invoked by the London Government to inform the EU of Britain’s intention to leave the European Union [if it ever is invoked], Britain remains a member with all the rights of access to EU staff and MEP’s in Brussels. This is a situation of which the heritage sector must take full advantage. Environmental and heritage protection must not be watered down as a sweetener to the British Government in any Brexit negotiations. Fundamentally, the free movement of academic staff and students is a minimum requirement to ensure that British Universities, students and researchers can remain part of a vibrant international community and that the sector does not oppose the principle of the Free Movement of Peoples. Finally the sector must again show its commitment to the wider international community by insisting that the UK participates fully in all legal and policing initiatives to combat heritage crime and the trafficking of antiquities. Surveying the wreckage of the post war settlement, national and international, it is clear that all of us in the Archaeology and the heritage professions cannot and must not, stand above the incredibly knotty, dangerous and contradictory, social, legal, political and economic questions which the the Referendum result has raised. However, there is a more fundamental reason why the heritage professions must be fully and publicly engaged in trying to find the paddles required to navigate out of the creek of effluent Britain finds itself in, thanks to the referendum result and the craven abdication of responsibility by those who navigated us here; David Cameron, Boris Johnson, Michael Gove and Nigel Farage who steered the course and Jeremy Corbyn and his staff who were too busy trying to organise drinks in the ship of state’s brewery to realise what was happening. 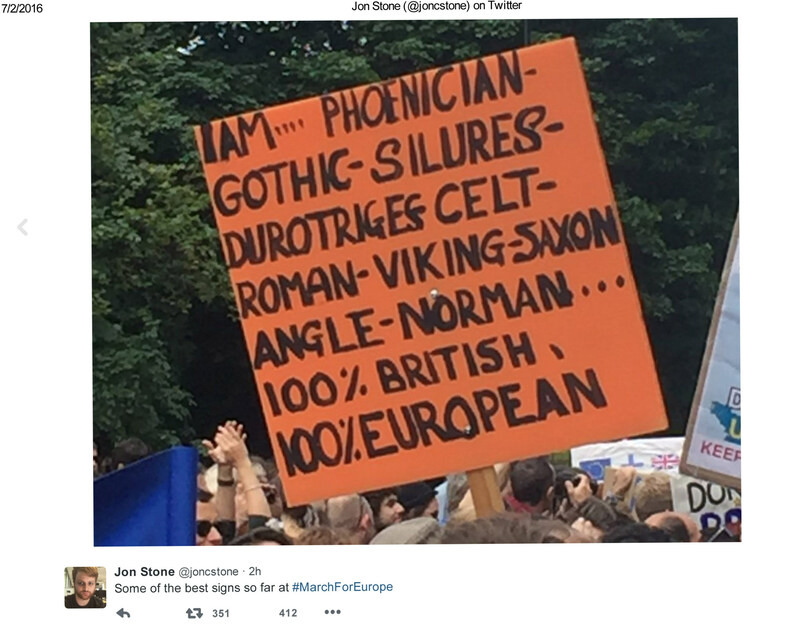 As the image taken from the March For Europe which took place in London on 2 July which heads this article suggests, archaeologists and historians exist to take the long view and place current events in their historical perspective, offering coherent thoughts and a positive, tangible sense of history and place, as our communities, and nations, seek to redefine themselves in the wake of the Referendum vote of 23 June. In that sense we are some of the “experts”, infamously derided during the Brexit campaign by the would be Tory Tyrion Lanister, former Secretary of State for Education, Michael Gove. As such, whatever our individual political leanings, we must not duck our responsibility to the communities we live in, and live with. Above all we cannot in all conscience be part of what political analysts like Matthew Flinders, Professor of Politics at the University of Sheffield call “Post Truth Politics”. Politics of the kind which was on show from both sides during the referendum campaign, but instead must oppose it actively, loudly and bravely. This is an absolute duty because our profession and calling remembers all too well where “Post Truth” politics can take us. It can take us to the Forschungs- und Lehrgemeinschaft des Ahnenerbe of Nazi Germany where too many archaeologists subordinated fact to a populist, racist, national fantasy and wore lightning runes on their uniform collars; to the censorship, revisionism and suppression of the discussion of inconvenient events like the Katyn massacre, of the Soviet Science Academy in Stalinist Russia; and into the waking nightmare of the populist, sectarian political systems which spawned them.